SACRAMENTO, Calif. /California Newswire/ — On Thursday, the California State Senate approved Senate Concurrent Resolution 110 authored by Senator Tony Mendoza (D-Artesia) on a unanimous bipartisan vote. The resolution designates March of 2016 and each year thereafter as Brain Injury Awareness Treatment and Prevention Month in order to promote public awareness on the extent, causes, consequences, treatment, and prevention of traumatic brain injury (TBI). “Each year millions of Americans sustain traumatic brain injuries. 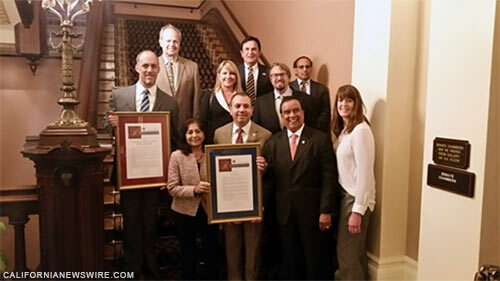 SCR 110 will help raise awareness regarding the causes, treatment, and consequences of people living with a traumatic brain injury,” said Senator Tony Mendoza. Each year, 1.7 million Americans, including 250,000 in California, sustain a TBI, also known as a head injury or acquired brain injury. Traumatic Brain Injuries occur when there is sudden trauma to the brain caused by a violent blow to the head or when an object pierces the skull and enters brain tissue. Symptoms of a TBI can be mild, moderate, or severe, depending on the extent of the damage to the brain. According to the Centers for Disease Control (CDC) TBI is a contributing factor in roughly one-third of all injury-related deaths in the United States. The leading causes are falls, motor vehicle accidents, assaults, sporting-related injuries, and occupational injuries. Males are 1.5 times more likely than females to sustain a TBI and those between the ages of 0 to 4 and 15 to 19 are more likely as well. The annual direct and indirect medical costs of TBI in the United States are an estimated $60 billion. It has been the signature injury of the wars in Iraq and Afghanistan, and presented new challenges for members of the military and their families. “Raising awareness about this issue will hopefully spur more research into treatment and bring more support for those individuals and the families who have a loved one suffering from traumatic brain injury,” said Senator Mendoza. The Federal Traumatic Brain Injury Reauthorization Act of 2014 provided new authority for the CDC to review brain injury management in children, and to identify ongoing and potential opportunities for research. Senator Tony Mendoza, a Los Angeles native and former elementary school teacher in East Los Angeles, represents the 32nd Senate District encompassing portions of Los Angeles and Orange Counties. For more information about Senator Mendoza visit his website http://sd32.senate.ca.gov/node/4 – or follow him on Facebook and Twitter.